One of our readers, Anthony, wrote us to find out which beard combs we recommend. During our reviews we learned a few surprising facts that we wanted to share with you about the best beard combs on the market. If you have a comb that you want to recommend, please vote for it below or add a new review at the bottom. Kent’s Handmade Combs are the top rated for their quality and price. They offer combs in different sizes. Kent’s also sells a Gentlemen’s Comb set that features a folding combine, a beard and mustache comb, and a pocket comb. Each tooth of the Kent comb is saw cut into place, and the internal surface of the teeth are flat, allowing the comb to glide through your beard hair smoothly within pulling. After all the teeth are saw cut, a professional polishes them for a smooth finish. These refined and polished edges allow the comb to slide through your mustache smoothly without snags. The spaces between the teeth are much more precise than in a molded comb, arranging your hair more symmetrically. The material from which the combs are made also differs from generic combs. Kent’s combs are made of cellulose acetate, rather than polystyrene plastic. 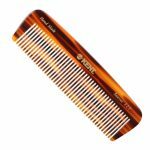 The size of this comb is small, features fine teeth, convenient to carry, and useful for your everyday grooming. In fact, it is the first step in having a soft and well-maintained beard/mustache. G.B. Kent & Sons Ltd. has been making hair combs, brushes, and even toothbrushes since 1777. With over 236 years of history, Kent has experience on their side and has over 250 varieties of brushes alone!. Cheap combs are made by the thousands using molds. Once they come out of the mold, they are packaged and sold. Though convenient and fast, this molds used to make these combs become worn with time, and the generic combs often have a mold parting line on the comb that doesn’t glide through the hair. If you look at one of these cheap combs closely under a magnifying glass, you will discover microscopic jagged ends. These jagged ends catch and tug your hair, causing damage and split ends over time. A quality comb like Kent’s Hand Made Beard Comb, on the other hand, is sanded and polished to eliminate these microscopic jagged ends.